If you guessed I’m the one in the middle wearing the poncho you are correct. The gal in the grey is a friend and my little sister, wearing the same pants as me, is three years my junior. I would be seven here and she is four. My Grandma used to make most of our clothes when we were kids. She was very keen on pantsuits at the time. I am positive we had a matching button up top that went with these pants. My Grandma was very frugal and always used the same pattern and fabric for my sister and I. We were dressed like twins. It drove me nuts. I am sure my totally unique-unto-me personal style obsession dates back to having to dress like my sister when I was growing up. It is possible that my Mom crocheted that poncho I’m wearing. Flash forward some 43 years…SCARY! I never thought about wearing a poncho in summer before I stumbled across this piece at my favourite consignment store. I wore this outfit on my surprise 50th birthday trip out to the theatre. This is a very weird top. It is literally a massive rectangle with a hole in the middle for your head. What drew me to the piece was, of course, the amazing colours and soft watercolour floral pattern. I’m wearing a black camisole underneath to avoid any wardrobe malfunctions. Necklace and bracelet are handmade see more at my Etsy shop. I don’t think this is a figure flattering piece. I’m perilously close to floaty, oversized, I’m-just-covering-my-big-belly territory in this outfit. I do love the pattern and the colours though so I’m willing to risk looking like I’m in my third trimester. I know that choosing heels instead of flats would have helped with this issue, but I needed to be able to walk comfortably all day. Keeping it real folks! I’ve spotted some other ponchos for summer below. I’m a bit in love with that first crocheted one in beige though I think it would look awful on me. Do you like ponchos? Have you ever worn one in summer? On another subject, my post, “Top Ten Stylish Comfortable Shoes For Mature Feet” was chosen by IFB to be featured in their Links à la Mode this week. I found the post by Outfit Zest: Quitting Fashion very interesting. Oh what a cute picture of you and your sister and your friend! 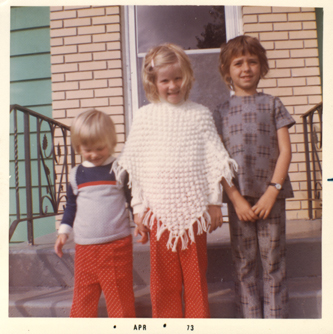 I have an old picture of me with my cousin, and I’m wearing a floral poncho… I guess we all wore ponchos in the 70s. Yes! I also wore a poncho as a child. Always croched by my mother or granny, mostly in rainbow colors which looking back was obviously using up any bits of wool left over from other knitted garments! It’s surprising how frugal people were those days. I remember a huge “Rag Bag” full of scraps of fabric and a large basket full of wool, always on hand for the next project. I don’t presently own a poncho but I do like them. The one you are wearing is perfect on you, colors are lovely and you wear it well. You really do have a great style and I kind of want to go out today and look at ponchos and kimonos! Won’t be croched though, not a trend I would reinvent. I do love my crochet tea cosy on my tea pot though, hand made of course in rainbow colors by an elderly aunt! Thanks Suzanne for the flashback. You certainly were a cute little girl! As for your beautiful piece you’re wearing—-it’s absolutely fabulous—it’s really a piece of artwork. I disagree though, in the flattering aspect. Since you’re wearing skinny jeans, I don’t think you look pregnant at all! 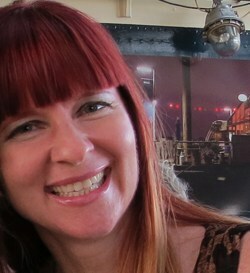 I can’t really tell in the photos-but is it sheer? Anyways—I love it, so if you decide you’re done with it—we can play swap and share!! I love ponchos. Your colorful flowery one is so pretty. So fun to see young Suzanne! And I get that about your sister. My brother was only a year younger than me and my mother insisted on treating us like twins. I hated that. Never wore a poncho. Never had the opportunity. I do remember the Seventies and the popularity of them back then. You look cute here. There are 15 months between my sister and I, and growing up we were dressed the same. My mother made our clothes too! My grandmother would crochet a dress each every Christmas but at least they were different colours! I was in college during the seventies and the were most definitely a fashion item. In Minnesota they were primarily a fall fashion piece. Winters here are far to frigid to wear them. I remember that they made it difficult to carry your shoulder strap purse or a load of textbooks around campus. My favorites were the classic Mexican version which are still available. The crochet type, made by mom or grandma undeniably has a memorable place in many Boomer hearts! Your poncho-like top is so pretty Suzanne. You wear it well in both eras of your life!! Oh yeah, red knit poncho. I remember it well and I loved it. It was groovy. I love your first photo! To my eye, the floaty breezy quality cancels out any of the other stuff you mention. Other women will see you in this and think, jeez, I wish I was wearing a poncho today too. I’m so happy that it’s a big rectangle with a hole for your head! I might be making a poncho soon and maybe I can manage a rectangle. We’ll see. Dare I say…it looked so simple that even I could do it? LOL Better not say that. When you think about it, ponchos make more sense in Summer than Winter with their floaty let-the-breeze in quality! I recently made one into a skirt. Happy 50th my dear! It’s great on this side of the divide. Yay! 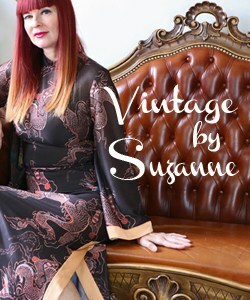 Congrats on the feature Suzanne! And don’t you look cute with your white poncho. I always love the look of ponchos on other but on me not so much. I always look like I am wearing a tent and not sure how to make it look better. This summer piece looks great on you. 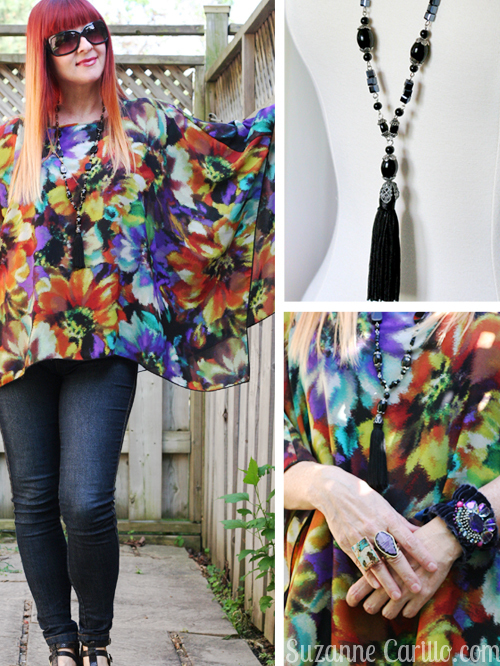 OMG .. in love with this colorful poncho! And yeah, I grew up wearing ponchos .. usually ones my grandma knit for me! My mother and I had matching, rust-coloured, crocheted ponchos back in the 70’s that were made by a friend. My grandmother made a lot of my clothes too, and I spent a lot of my childhood wearing polyester. I have a couple of summer tops that are basically large rectangles with a hole for your head, and arm holes which make them closer to tops than ponchos, but they have the same drapey shape. i don’t think you are anywhere close to “third trimester” territory in that outfit. It is obvious from the fitted pants that you have a trim shape. That GIF is too cute. I love the poncho flappy drapey thingy! I guessed it right, dear Suzanne! You are the one in the middle! I love ponchos, yours was lovely! Good that your sister didn’t have one in the picture, as you said, your grandma used to sew the same things to you two! But that was crocheted. Anyway, yes yes to ponchos! I wore them since childhood too. My grandma used to travel to a certain region where men and women wear ponchos and brought some to me. I was so happy! Your poncho now I saw more like a tunic, but it’s a poncho, of course. And I loved it – beautiful vibrant print and colors! I loved the gif, as well 🙂 You look lovely! Not for a second I thought you would be in the 3rd trimester 🙂 I had to smile 🙂 The linkup is on today, if you want to help me 🙂 Thank you so much! Congratulations for the Links a la Mode! hahaha, the gif is for me too 🙂 I even forgot to send greetings and Bisous! I actuall dont like them because I hate everything g that has to be pulled over my head! That is when I am going out. I usually wearmy hair very High and big and pulling a poncho over it is awfull! Nice pictures though! 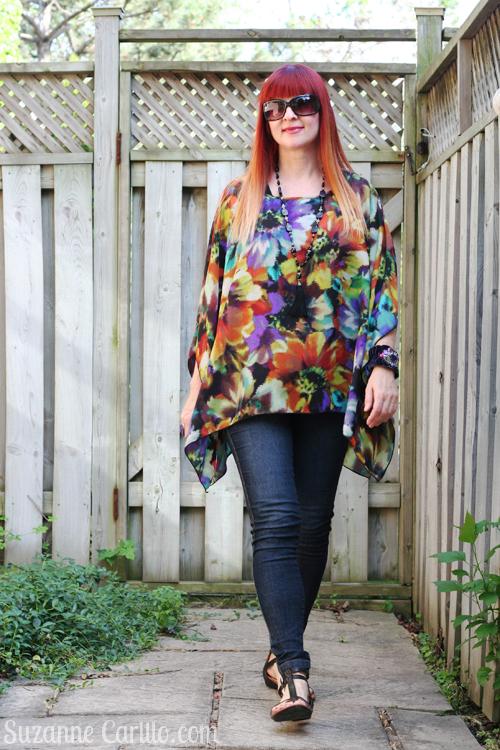 I adore a cute poncho…and yours fits the bill! I would wear one for the summer, if it’s lightweight enough. What a cute picture. I’m pretty sure there’s a few photos of me dressed identically as you. You can’t beat a poncho. I hadn’t thought about wearing a poncho in summer–I have a couple I wear during transitional seasons, but now I want to find a “floaty” summer one! It just seems a lot cooler for warm weather than a regular top. Plus, I love the colors in yours! That pic of you as a little girl is so cute! You and I must have had the same grandmother. Mine made matching outfits for my little sister and me as well. Once, she made a whole passel of outfits so my mom, my sister, and I could all dress the same. So chic. Love the poncho,, any season is good for ponchos other than winter! Loved that photo you you in your youth, stylish then too! Yes, it is hard work! congrats on the iFB link! Hmmm…I think that poncho is actually very flattering on you, and I love the colors. I think it’s perfect with the flats and jeans. I have several winter ponchos, but I like the idea of one that’s airy and light like yours. 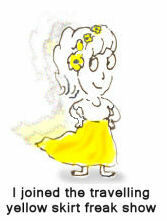 Love the picture of you as a little girl – adorable! I love it and it loves you. It looks very good on you. Don’t you ever dare to throw it out. Unless I am there to pick it from your trash can haha. No seriously, it looks GOOD on you. Thanks for the gif haha. I agree, it is exhausting.